Cultivating a healthy relationship with food. Have you ever eaten dinner and then thought....that was great but I could really do with something sweet? This crumble is so easy you can throw it together as an after thought - with only the basics from the cupboard. Growing up, desserts were a rare thing in our household, although through the winter I clearly remember Dad baking different delicious desserts in our wood fire oven - often using up leftover ingredients. Rice pudding was a common treat after a late cold night at scouts. But the clearest memory I have is of apple crumbles made from our fruit trees, sometimes featuring pears, rhubarb or berries depending on what was in season at the time. 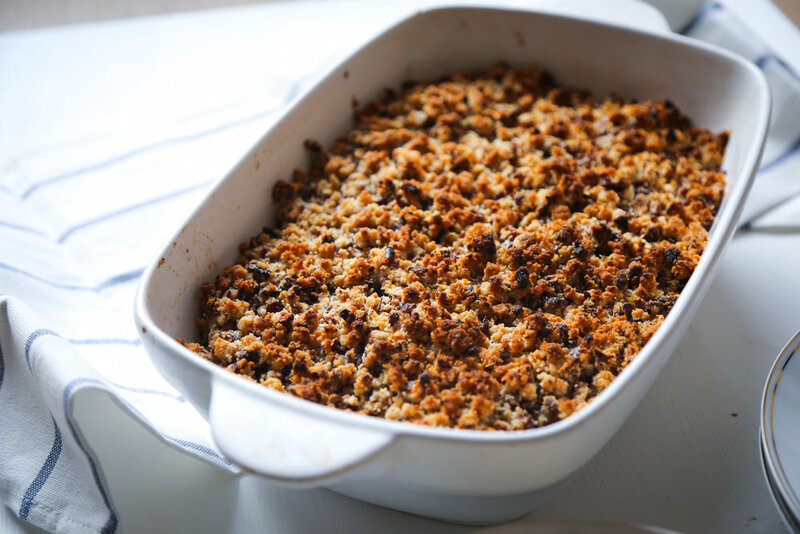 There is something so comforting about a good crumble. It instantly brings back memories of being warm and cosy around the fire and is the perfect dessert for the winter months. We often ate the leftovers for breakfast warmed up and served with some natural yoghurt. This version is my take on the classic dish. I have cut out the refined sugar and white flour usually used in crumbles and swapped it for almonds, coconut and dates. I honestly don't think anyone would know the difference. Serve it up at your next family dinner and see if anyone can tell it's healthy. I'm going to test it at dinner with the in laws tomorrow night. I hope you all enjoy. Let me know how you go!! Quarter apples and remove the core. Cut each quarter in half lengthways and then in half across. Place apples, berries, wine, honey and vanilla in a pot on a medium heat with the lid on until the liquid is released. Remove the lid and bring the mix to a slow boil. Stir occasionally and continue to boil until the liquid is reduced by half and the apples are soft. Pour into a baking dish and set aside. Place all ingredients for the topping in a food processor and pulse until the mixture resembles bread crumbs. Sprinkle over the filling making sure to spread evenly. Bake @180'C for 30-40 minutes or until golden and crispy. Serve with whipped cream, coconut cream or yoghurt. Enjoy.